2017 NBA Finals: Can LeBron’s Cavs beat the unbeatable Warriors? The NBA Finals are here, and it’s not surprising that the same two teams that played in June last year are back for round three. It’s the rubber match of the much-anticipated rematch between the Golden State Warriors and the Cleveland Cavaliers. The Warriors are still hurting from last year’s defeat at the hands of the Cavs. They were up 3-1 in the series when Draymond Green decided to hit the Cavs below the belt. Draymond’s suspension and the injury to center Andrew Bogut flipped the series toward the Cavs. LeBron and Co. won three straight games to win the 2016 title in an epic Game 7 at Oracle Arena. Draymond said the next time he sees the Cavs he wants to “annihilate” them. That’s exactly what’s going to happen in the 2017 Finals. The Warriors, who own a perfect 12-0 record in the postseason, are armed with the best offense the game of basketball has ever seen. They have arguably four of the 15 best players in the league in Steph Curry, Klay Thompson, Draymond, and Kevin Durant. They have two of the best defensive players in the league in Draymond and Klay, and they have without a doubt the three best shooters in the world in Steph, Klay, and KD. Cleveland has some firepower of its own led by The King, LeBron James, and his band of Cavaliers. Kyrie Irving may be the best one-on-one player in the NBA. And Kevin Love and Tristan Thompson are beasts on the boards. Heading into the 2017 NBA Finals, the question is do the Cavs have enough weapons to keep the Warriors from winning their second NBA title in three years? The answer is “no.” Put it this way. If LeBron can win two games against these Dubs, he should get a statue at every arena. These Warriors are just that good. Adding Kevin Durant to a team that went 73-9 the previous season is like Batman joining The Avengers. The Warriors and the Cavaliers played against each other twice during the regular season, but both games are not good indicators for what will happen in The Finals. The Christmas Day game was won by the Cavaliers 109-108 at Quicken Loans Arena on an incredible fadeaway shot by Kyrie. The second matchup on MLK Day was a 126-91 blowout by the Warriors at Oracle. In the game Cleveland won, the Warriors were still figuring out how to play with Durant and the Cavs hadn’t remade their roster yet. In the game Golden State won, the Cavs were on the tail end of a long road trip and looked fatigued by the time they landed in Oakland. 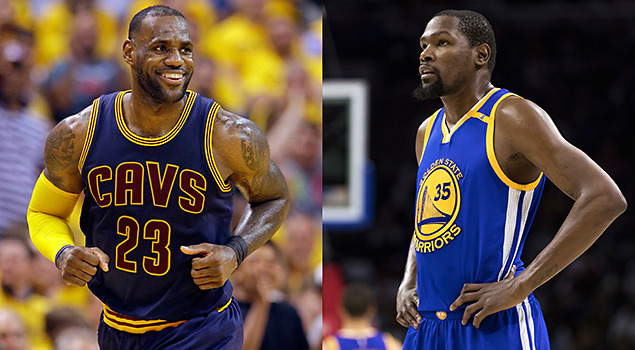 Here’s a breakdown on how the 2017 NBA Finals will shape up offensively and defensively. To start the game, Cavs coach Ty Lue will likely use Kyrie Irving on Klay Thompson, J.R. Smith on Steph Curry, Love on Zaza Pachulia, and Thompson on Draymond. That leaves the juicy matchup on the wing between the two best forwards in the world in LeBron and KD. But enjoy it while you can because LeBron won’t stick Durant the whole game, especially if he gets into early foul trouble. Look for Smith or Iman Shumpert to slide over and defend Durant to give LeBron a break. When the game gets to the fourth quarter, LeBron should stick Durant especially when the Warriors go to their “death lineup” with Draymond at center, KD and Iguodala at the forward spots, and Steph and Klay in the backcourt. The Cavs can hide Love on defense by sticking Iguodala, but they can’t hide both Kyrie and Love. Kyrie will need to defend either Steph or Klay down the stretch. Most likely, Kyrie will guard Steph but he’ll have plenty of help. Expect the Cavs to trap Curry and force him to give up the ball. This is where The Finals will either be won or lost for the Cavs. Once they double team Curry, the ball will start moving for Golden State. That means the Cavs’ rotation must be sharp and in-sync. They cannot afford to let go of the rope at any point because once they do it’ll be lights out. This is the defense they played last year and they usually leave one shooter open, which was Harrison Barnes. This year, the Cavs won’t have that luxury. There no more weak links on the Dubs, so the Cavs’ defensive rotations will need to be sharper and they can’t afford to leave any shooters open. LeBron James and Kyrie Irving are the best isolation players in the league. In the weaker Eastern Conference, this worked to near perfection. The Cavs were able to find the matchups they wanted and exploited them using ball screens. But the Warriors are a completely different beast. They switch everything on defense and Draymond Green is the best quarterback on defense. Green covers up all the mistakes of his teammates, and he can also handle his own in the post or the wing. Green’s greatest strength is ability to spark his team with his intensity. He is the driving force behind the Warriors’ machine and he never backs down from a challenge. Add Kevin Durant’s length and quickness and it is almost impossible to mount any kind of a consistent attack against the Dubs. To start the game, Steph Curry will guard Kyrie, Klay Thompson will guard J.R. Smith, Draymond will stick Tristan Thompson, Zaza Pachulia will stick Kevin Love, and KD will be on LeBron. What to watch closely is when Cleveland goes to its second unit. Lue has been using Deron Williams, Shumpert, Kyle Korver and either Channing Frye or Richard Jefferson to run with LeBron. This is not a great defensive lineup for the Cavs, so expect the Dubs to try to expose the older and slower Williams and Korver. Williams looks like he’s got some gas left in the tank as long as you don’t have to stretch his minutes. Korver was brought in to open the floor with his 3-point shooting. If he struggles, Lue could have a short hook. And if the Dubs begin to pull away, Lue may be forced to shorten or abandon his rotation.